Just as optical telescopes collect visible light, bring it to a focus, amplify it and make it available for analysis by various instruments, so do radio telescopes collect weak radio light waves, bring it to a focus, amplify it and make it available for analysis. We use radio telescopes to study naturally occurring radio light from stars, galaxies, black holes, and other astronomical objects. We can also use them to transmit and reflect radio light off of planetary bodies in our solar system. These specially-designed telescopes observe the longest wavelengths of light, ranging from 1 millimeter to over 10 meters long. For comparison, visible light waves are only a few hundred nanometers long, and a nanometer is only 1/10,000th the thickness of a piece of paper! In fact, we don’t usually refer to radio light by its wavelength, but by its frequency. Naturally occurring radio waves are extremely weak by the time they reach us from space. A cell phone signal is a billion billion times more powerful than the cosmic waves our telescopes detect. Radio telescopes are built in all shapes and sizes based on the kind of radio waves they pick up. However, every radio telescope has an antenna on a mount and at least one piece of receiver equipment to detect the signals. Because radio waves are so long and cosmic radio sources are extremely weak, radio telescopes are the largest telescopes in the world, and only the most sensitive radio receivers are used inside them. Unfortunately, these huge antennas also pick up radio interference from modern electronics, and great effort is taken to protect radio telescopes from radio frequency interference. The most basic antenna is a metal dipole antenna, often used on cars to pick up the radio waves broadcasters use to carry their audio shows. The most versatile and powerful type of radio telescope is the parabolic dish antenna. The parabola is a useful mathematical shape that forces incoming radio waves to bounce up to a single point above it, called a focus. Dish antennae bounce many different wavelengths at once, and we need different receivers to tune to different frequency channels for the different kinds of research we do. To observe a specific wavelength range, we select a specific size funnel to grab the radio waves we want. These funnels are called feed horns, and our largest is the size of a pickup truck! The diameter of the narrow end of each feed horn is the same size as a critical wavelength of the channel we want. What that means is that when the specific radio wave travels to the narrow end of its particular horn, it is beating perfectly against the sides, and the horn becomes the true antenna detecting the pulse. Here, we place a supercooled receiver to collect the back and forth pulse of the wave as a signal it can send to the computer. We can either hang a feed horn and receiver at the focus above the dish, or install a mirror to redirect the focused waves down into the center of the dish where we can set multiple receivers. If we place receivers at the focus, above the dish, the detected signal travels by cable along the feed support structure to a point near the ground where it can be recorded and analyzed. These prime focus feeds are limited by the weight and size of the feed horn that will safely fit up there and how tricky it might be to reach them for human maintenance. More often, to get the most out of the giant dish’s collecting power, we use a secondary mirror called a subreflector at the prime focus (or near it) to reflect focused waves down into a more convenient location — the center of the dish. 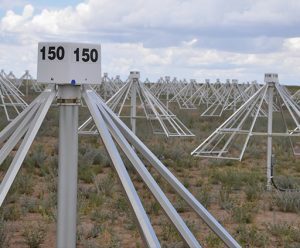 Many of the subreflectors can be tilted to aim at the different feed horns in the center of the dish or to catch a glancing view of the sky to gather data about air quality conditions. If the lengths of the radio waves we’re studying are very small, such as the millimeter waves collected by ALMA, then the perfection of the telescope’s dish surface is critical. Any warp, bump, or ding in the parabola will scatter these tiny waves away from the focus, and we’ll lose information. We also have to consider the extreme environments where radio telescopes may operate. Wind and temperature differences can deform the parabola of a big radio telescope’s dish and the pull of gravity affects the heavy antenna as it tilts to different parts of the sky. Therefore, the dishes of ALMA are kept small in order to better control their perfect shapes under these constantly varying conditions. 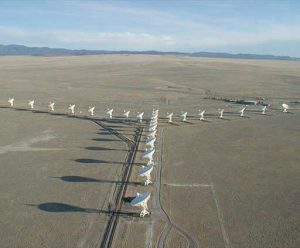 If the size of the radio wavelength being observed is very long, such as the centimeter waves picked up by the VLA and the VLBA, then the perfection of the dish’s shape is not as critical to keep excellent observations of the radio sky. Those dishes are made rigid and tough and withstand the rigors of moving and working in various conditions. The dishes of some radio telescopes spin around a shaft that is aimed at the North Pole Star. These equatorial mounts allow the telescope to follow a position in the sky as the Earth rotates, simply by copying the Earth’s axis of rotation and moving against it. But large equatorially-mounted radio telescopes are difficult to build, because they require millions of pounds of telescope to balance at many awkward angles. The largest ever built is our 140-foot (43-meter) dish telescope in Green Bank. In most modern radio telescopes, a digital computer drives the telescope on simpler tilt and turn axes . This is how we can fully-steer 17 millions pounds of the GBT all across the sky. In early radio telescopes, we had to tune into single, specific frequencies to watch for signals molecules of gas in space. Modern radio telescopes observe a large number of frequencies all at once, with computers dividing the frequency band into as many as several thousand separate channels that may range over tens to hundreds of megahertz. This innovation has changed radio telescopes from the equivalent of black and white cameras to full color. In order to detect the faintest signals, the telescope remains staring at its radio source for hours, similar to keeping the shutter of a camera open. Our computer software keeps adding the waves together repeatedly to increase the signals from astronomical phenomena, and let the random noise signals coming from the receiver and the Earth’s atmosphere average out over time. Flying southward over the Very Large Array in central New Mexico shows the flatness of the Plains of San Agustin where the array is sited. At over 7,000-feet elevation, this ancient lakebed provides the space needed to lay 40 miles of double-track rails required to extend the VLA’s Y-shape to give us its highest resolution capability. The ability of a radio telescope to distinguish fine detail in the sky, called angular resolution, depends on the wavelength of observations divided by the size of the antenna. In other words, to get finer detailed views of the sky, the result of that simple equation needs to be a very small number. Radio telescopes observe long wavelengths, so even when we divide our shortest radio wavelengths by our largest antennas, we still only have an angular resolution similar to that of your unaided eye observing the sky. To have their resolution compare to optical telescopes, a radio telescope’s antenna size needs to be much, much larger. The largest moving radio dish is the Green Bank Telescope, 100 meters across and fully-steerable. And that’s about the maximum size for safely and accurately controlling a moving radio dish. The world’s most gargantuan radio dish, the 1000-foot bowl in Arecibo, Puerto Rico, cannot move, but it can point on the sky by moving its receivers. The dish is supported inside a large sinkhole in the island’s karst terrain. Math finally cracked the conundrum: combine the views of a group of antennas spread over a large area to operate together as one gigantic telescope. This innovation won a Nobel Prize in physics. Here’s how it works: Two radio telescopes observe the same radio source. The telescopes are a known distance apart on the ground. The radio waves coming from the source will therefore arrive at one telescope at a slightly different time than the other. We see the slight difference in the way the waves show up, with one arriving slightly behind the other. The difference is a time delay in the phase of the wave. The Atacama Large Millimeter/submillimeter Array links its 66 near-mirror reflecting dishes with a supercomputer. When we combine the two offset waves, they will not overlap perfectly due to their phase shift, creating what we call interference fringes. As the Earth turns and the telescopes tilt to keep watching their source setting, the angles of their observations change. This tracking movement of the telescopes changes the distances the radio light travels from the source to each of the telescopes, in the same way that shadows are longer when the Sun is lower. This translates to different phase delays between the waves reaching each telescope. The longer we observe, the more variations we get. The more variations we get, the more perspectives we have on the object we’re observing. And the farther apart we separate the telescopes, the sharper their binocular view of the sky becomes. In arrays such as the VLA and ALMA, a device called a central local oscillator sends a common, lower frequency timing reference signal down fiber-optic cables to each antenna, behaving much like a conductor keeping a manageable tempo for the orchestra. The data received by each antenna are mixed with the local oscillator signal and then travel back down the fiber, to the main computer known as the correlator. The lower frequency signal allows the correlator to process and combine the data from each telescope at a rate that the computers can handle. However, the telescope arrays still need some of the most advanced computing technology in the world to handle the data. The correlator synchronizes the incoming data from the different antennas to within a few millionths of a second of each other. It pairs up each antenna to every other antenna in the array, creating hundreds of unique perspectives on the same object. For every minute of observations, the perspectives change. To keep up with this constant and complex data stream, our correlators are among the fastest supercomputers in the world, performing their calculations at femtosecond speeds – up to 16 quadrillion operations every second. Special software designed by radio astronomers and software engineers then assembles the data to create maps of radio objects in the sky. Radio telescopes like the Long Wavelength Array, seen here, do not need accurate dish surfaces to detect radio waves from space. These use dipole antennas in a cross-shape. The farther we separate our radio antennas, the larger the telescope they mimic. The phase shifts they see are even greater, which means their narrower overlap is a finer detail view of the sky. With this level of accuracy, radio telescopes spread very far apart can pinpoint exact locations of radio objects in space, including distances from Earth. We call this system Very Long Baseline Interferometry, or VLBI for short. The Very Long Baseline Array (VLBA) is the world’s largest VLBI system dedicated to full-time research. However, keeping these widely-separated telescopes in time with a central conductor is challenging, because connecting them via fiber optic cabling is way too expensive. Very High Frequency (VHF) or Ultra High Frequency (UHF) radio links can be used, we’d need several repeater stations to keep the signal boosted. This is impractical for distances greater than a few hundred kilometers. Instead, atomic clocks at each telescope stamp the time onto their data drives. A hydrogen maser frequency standard gives a timing accuracy of a few billionths of a second and a frequency stability of one part in a billion billion. Hard drives save these stamped data, and station managers mail those drives back to technicians at a correlator. In the case of the VLBA, this hub is in Socorro, New Mexico, and the correlator uses off-the-shelf components to digitally combine the data drives’ contents into a single observation. The observation is sent to the scientist, and the entire process takes less than a couple of weeks.